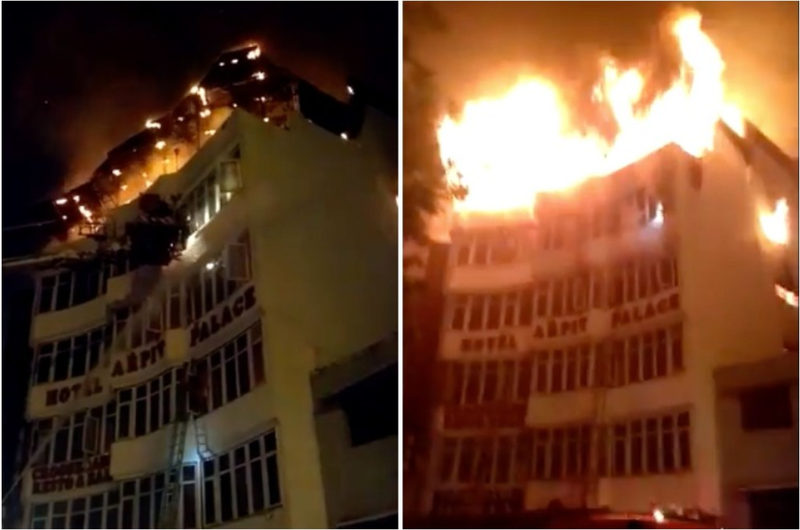 Shocking footage shows the entire top floor of the Arapit hotel go up in a harrowing blaze at around 4:30am local time (11pm Monday GMT). Many of the victims were sleeping when the fire – believed to have been caused by a short circuit – broke out. Among the dead were guests who tragically tried to jump from the fourth floor as the flames engulfed the building. Delhi Minister Satyendra Jain said that most of the victims succumbed to suffocation – while many more people have been injured. He said strict action will be taken against anyone found guilty of criminal negligence and an inquiry has been launched. Deputy Chief Fire Officer Sunil Choudhary told local news service ANI: "The fire has been doused. "We have to look for bodies, if any, inside the hotel. "Those injured have been sent to hospital. "Two hotel staff members had jumped from the fourth floor of the hotel in an attempt to save themselves. "The status of the staff who jumped is yet to be known." It is believed that the entire 35-room hotel had been booked out by one family for a wedding, according to local news source Garg. At least 22 fire crews battled for four hours to douse the flames while 35 people were rescued. The fire raises fresh questions about the safety standards in less affluent areas of the Indian capital – which is home to more than 18million people.